Engaging young people to take part in the interactive session on the competitive job market. "But why should I add you in?” – was the instinctive question posed by an ancient cavemen to a nervous shelter-seeking outsider. The mystery of this timeless question still baffles the fresh graduates sceptical of the perfect resume or confused of the appropriate attire while approaching their first job interview. 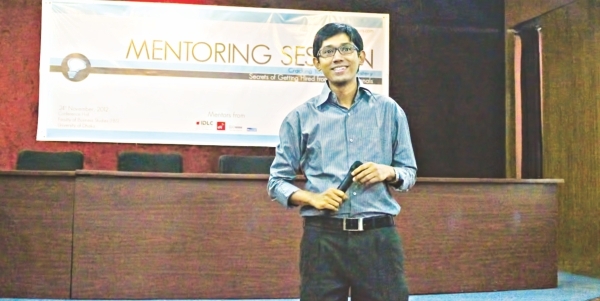 To mentor and groom the insecure graduates, THE PRENEURS, a national learning and development platform for Bangladeshi youth organised a career mentoring session titled 'Cracking Your First Job Mystery: Secrets of Getting Hired by HR Professionals' at the Faculty of Business Studies (FBS) Conference Hall, University of Dhaka on November 24, 2012. Driven by twofold focus of corporate grooming and entrepreneurial mentoring, THE PRENEURS strives for talent development of the Bangladeshi youth by minimising knowledge gap and information asymmetry. In this regard, the first endeavour of THE PRENEURS was the compact session mentored by Farhana Sharmin Shumi, HR Manager of IDLC Finance Limited; Shariful Islam Khan, Executive Vice President (EVP) of Bank Asia Limited and Md Sharif Bin Mohiuddin, HR Business Partner of ROBI Axiata Limited. The eager wait of a large pool of participants from University of Dhaka, Jahangirnagar University, North South University, East-West University, ASA University and from several others came to an end when the session kicked off with an engaging maiden speech by M Saimum Hossain, Co-founder and Managing Partner of THE PRENEURS and a global champion in several prestigious entrepreneurship contests. Shariful Islam Khan, in his motivational speech, emphasised on differentiating oneself since - “It's you who matters the most, not your university.” The tricks and techniques revealed by him regarding drawing the interview topic towards one's strength amazed the audience. Finally, he inspired the fresh graduates to follow their heart in choosing a profession. The final speaker of the session, Md Sharif Bin Mohiuddin, delivered a comprehensive presentation on writing a CV. It being the “window to get a call,” he stressed on being very specific on the CV since the recruiter is not expected to invest more than fifteen seconds in scanning it. The list of skills sought by the recruiter needs to be matched with the list provided in a CV. To pave the way for an interview call, he also stressed on tailoring the CV every time to “fit the job”. Nazmul Hossain, Adviser to THE PRENEURS, also an Assistant Professor of FBS, wrapped the packed session which stirred a surge of awareness among the participants. Sami Bin Sagir, another Co-founder and Managing Partner of THE PRENEURS, said- “To groom entrepreneurs and business graduates, we are coming up with a series of online and offline activities soon.” Mahadi Hasan Sagor, Managing Partner and COO of THE PRENEURS also echoed the same.